By Atomia , on 4.1.2012. Two great blog posts about DNSSEC was published today, one in Swedish by our client Binero and one in English by our friends over at Pingdom who interviewed our lead developer Jimmy Bergman (@jimmybergman) for the article. Hit the links if you want to know more about DNSSEC and why it is needed. By Atomia , on 2.1.2012. Before the holidays we wrote a blog post on how Atomia DNS has helped to sign a significant number of zones. 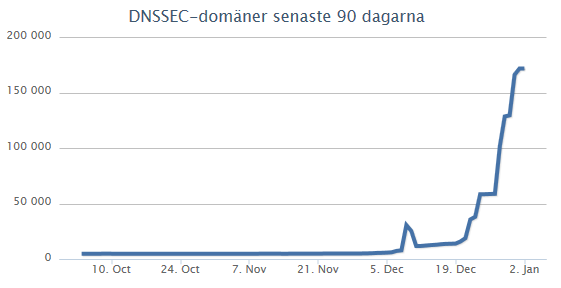 During the holidays our friends over at Binero went full throttle on signing zones and the result is shown in the official graph from .SE above. Last week Atomia DNS automated the signing of more than 100.000 zones.